Scene from a protest against the towers. 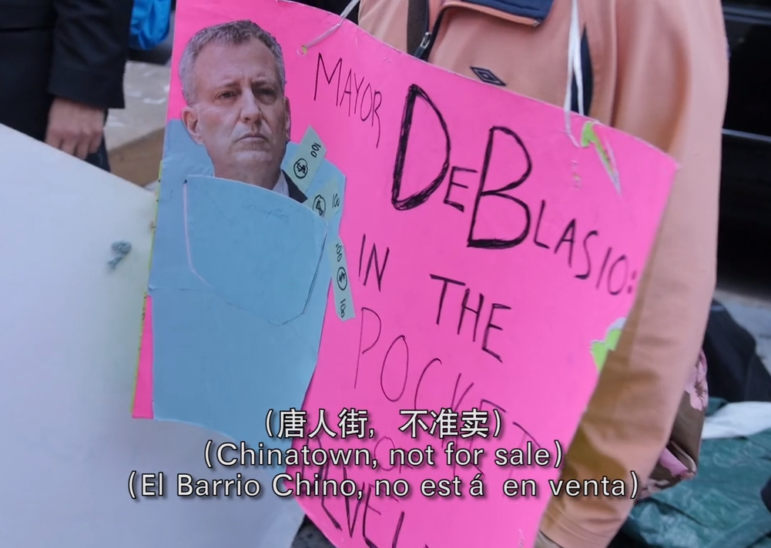 On MLK Day 2019, hundreds of people from Chinatown, the Lower East Side and across the city braved the subfreezing temperatures to march on City Hall. We marched to demand that the de Blasio administration stop the four illegal megatowers slated to rise in Two Bridges and pass the Chinatown Working Group rezoning plan in full. Our ranks were swelled by New Yorkers from across the five boroughs, calling for an end to the city’s pro-developer agenda. A few days later, Councilmember Margaret Chin, Borough President Gale Brewer and their associates “discovered” that the tallest of the four, the JDS megatower, is deed-restricted so that its land can only be used for “elderly and handicapped persons of low-income.” That means not only do these towers violate the zoning law (Article 7 Chapter 8 of the zoning resolution, which precludes any development that blocks air and sunlight or alters neighborhood character), they also violate its original mandate. You would think our elected officials would finally have the courage to say “no” unequivocally to these towers. After all, if the tower proposal violates the deed, shouldn’t the city then rescind the permit for the tower? If the city doesn’t know about what deeds are on these four sites, how can they be trusted to administer any development there? When the deed restriction for the Rivington House was lifted through a backdoor deal, questions were raised about the city’s complicity in the scandal. Evidence showed that while the shady decision was made by the mayor, Chin knew that the deed for the nonprofit facility would have to be lifted for the private development company to take it over. We see the same blame-game in this attempt to cover the city’s tracks in allowing the already illegal towers to be built. Chin uses this deed restriction to call for the proposed towers to go through the city’s ULURP process, an illogical conclusion that does nothing to stop the towers. From day one, Chin has stressed that she would not use ULURP to stop the megatowers. Instead, she merely wants to negotiate a few concessions from the developers—a handful of affordable units that no one can afford and some trees to line our parks and playgrounds. We’ve also seen how Chin has used ULURP in the past to help developers get their way. This happened in Essex Crossing, which is now home to Trader Joe’s and Target, and the NYU expansion which will allow a superblock of out of scale development. But what the deed restriction news reveals is that the political establishment is reacting to our community’s organized efforts. This shows that we have the power to change things if we come together. Elected officials can see the rising discontent of the community and hope to deceive people into placing our hopes for salvation in them. But this is not enough; we want fundamental change, not just a few crumbs. We don’t want these four megatowers that were approved by the mayor. That means we are up to challenge the mayor’s pro-developer agenda, and our successful march on MLK Day has demonstrated our determination. Our hearts aspire to reclaim our democracy and protect our community from displacement. On this, there can be no compromise. Our anger and hope cannot be satiated with a few crumbs. Therefore we the Lower East Side Organized Neighbors (LESON) are filing a lawsuit, which argues that, since the towers violate the Zoning Resolution that governs the area, they should not be built. Period. Illegal is illegal. So we call on everyone in the Chinatown and LES community to forge ahead, knowing that our cause is just and that the law is on our side. Whether our community prevails victorious is up to us all. David Tieu and Zishun Ning are advocates with Lower East Side Organized Neighbors (LESON). For more information and get involved, contact Coalition to Protect Chinatown and Lower East Side. One question. Where do these authors live? Before you go any further, please answer that question. Then answer this. You continually say, “We want the the full Chinatown Working Group (CWG) plan!” What are the CWG’s recommendations for the waterfront, subsection D? Please answer. Remember when you (David) said, “protect the core of Chinatown and let the waterfront have 35 story mega-towers”. Remember when you endorsed that at a real CWG meeting? Remember when you voted for that? Second, residents who actually live in the area are aware of the complexities of the LSRD (cuz we live here) and understand the strategy. We will take a ULURP. Most communities fight for a ULURP which is considered the gold standard for community planning. We are not just relying on a lawsuit. What happens if the judge says project can move forward, lawsuit over?! What, ask the Mayor to resign? How’s that working out? And how come your legal team didn’t uncover the deed restriction? Its not like the information isn’t public. On your next propaganda, you’ll claim that a deed restriction is bad for the neighborhood because the City Council and Borough President support such. By the way, the lawsuit complaint reads, THE COUNCIL OF THE CITY OF NEW YORK and MANHATTAN BOROUGH PRESIDENT GALE A BREWER. The Municipal Art Society (MAS) of NY also filed a Brief of Amicus in support of the lawsuit. I suppose the Borough President, the ENTIRE City Council and MAS are also in your blurry cross-hairs. Stop trying to divide the community with your political propaganda and your vendetta against Margaret Chin. We get it, your founder and the source of your funds mandates that you tie everything back to Margaret Chin. But stop doing so at the expense of my neighborhood. You simply don’t want the ULURP because of your dislike of Margaret Chin. That’s it. Stop trying to fool people into believing a ULURP is bad. You’ve accomplished actually zero since “discovering” our neighborhood. ZERO. And while that march drew a lot of people (I was there at Pike St.), it was completely void of people who live in the neighborhood. Just like you. City Limits-These are not the voices of people who live in our neighborhood. Perhaps you should talk to a few people who actually live in the LSRD and examine the CWG plan. Sorry to say but we miss the Lo-Down reporting. I used to live on Monroe Street. It was just few minutes of a walk to 227 Cherry where the PathMark used to be, and now Extell. My high school was also Monroe Street, which was also just few minutes away from PathMark. I used to walk pass the Two Bridges area everyday on my way to school. But, because of the rising rents and the worsening living condition, I had to move elsewhere. But to this day, I still work in Chinatown/LES areas. This is where I usually meet my old friends and new ones. I still have family members here. But, I was sad when my family had to leave the neighborhood. Ever since then, I keep my eyes on any news that have to do with my old neighborhood. Margaret Chin really does not represent Chinatown and LES. I have followed City Limits for sometimes now. I learned from City Limits that ULURP can only put the power back to the hands of the people who want to remove the long-term residents in the neighborhood. If you look at Step 6 and 7 of the ULURP process (outlined by City Limits), it is essentially Margaret Chin who will get to decide what gets built on that LSRD area. “6. The City Council automatically reviews some ULURP applications and can choose to weigh in on others. A land use subcommittee (Landmarks, Planning or Zoning) gets the first look, then the full Land Use Committee weighs in, and finally the entire Council can consider a proposal. By tradition, the Council usually follows the lead of the councilmember in whose district a project falls. The body has 50 days to act on a ULURP proposal. 7. If the Council has modified a ULURP proposal, it goes back to City Planning to decide if the change can be made without starting the ULURP process all over again.” (https://citylimits.org/zonein/ulurp-explained/). Margaret Chin had said that those proposed towers _cannot_ be stopped and ULURP is just a way to negotiate few “affordable” units. I remember see friends’ family lined up with hundred (if not thousands) others trying to apply to something like 140 units of “affordable” units at the Seward Park extension site. I don’t think ULURP at the LSRD Two Bridges site will help to “solve” the housing crisis. I don’t think that ULURP will stop those towers either; Margaret Chin, like those two authors said, is trying to basically use ULURP to negotiate with the city; at the end, those towers will be built. Shouldn’t something as big as building four towers be considered under the supervision of some even higher-up institutions at the federal or state level? I don’t think Chin should be the only person who decides the faith of those LSRD residents. Look at the recent public advocate debates, WHO DOES NOT CRITICIZE Mayor de Blasio? Even Melissa Mark-Viverito, Jumaane Williams, Rafael Espinal who supported de Blasio at different points have now turned AGAINST him for the Amazon deal. I follow the waterfront news closely as well. As far as I know, Rafael Espinal, currently a City Council member, who ran on the Conservative Party line during his first two runs for state Assembly in 2011 and 2012 and now calls himself a Democratic Socialist, signed a pledge to stop those Two Bridges towers. And, he signed it understanding that ULURP WILL NOT stop those towers. It is a matter of the Mayor. That is the answer to your question: “What happens if the judge says project can move forward, lawsuit over?! What, ask the Mayor to resign? How’s that working out?” The WHOLE debate around the special election for Public Advocate has turned toward the Mayor. Most of the people who live in displacement-targeted areas know about what the Mayor has done to them and what their local City Council has done to them; they go after the City Council and go after the Mayor. Do you hear the latest news about the Amazon deal? When people protest against the Mayor for bringing in Amazon to gentrify LIC neighborhoods and other nearby Queens neighborhoods, Amazon is now looking for a different location. I think the same can happen to Two Bridges towers. Do you think that putting political pressures on Mayor de Blasio will help to stop those Two Bridges towers? I look forward to your answers. While it seems almost certain the rent laws will be tightened it’s less sure that the geographic reach of the laws will be expanded.